LOBKIN Provides you a Stable,Elegant and Durable Tablet/Phone Stand. 1. Updated Solid. We adopt 4mm thickness aluminum which is 25% times thicker than others you may ever used before, and it is 3 times more stable that may be the most solid phone stand you had ever tried. 2. Wide Compatibility. Compatible with all Mobile Phones, E-Readers and most Tablets (up to 10.1 inch), even with the heavy duty case on. 3. Anti-Scratch & Anti-Slippery. Enlarged anti-scratch silicone pad provide you decent protection even your phone case is removed, also anti-skid on a 40 degree slippery slope (without cell phone loaded). 4. Multiple Angle Viewing. 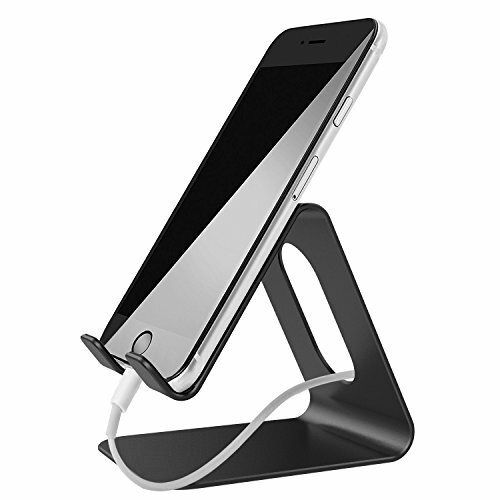 When you put iPhone 7/ 7 Plus (without case) on this stand, the viewing angle could be adjusted from 40 to 45 degrees, which is suitable for your multiple demand of viewing. 5. Excellence on details. Similar CNC technology as Macbook adopts, you could enjoy the comfortable sense of touch even on the edge. LOBKIN is always surpass your expection! You may need 3 stands to meet different demands: One on your desk on check emails, one on your bedside table to enjoy movies and one in the kitchen to enjoy the personal life. The generous and simple design makes it fit for totally different occasions. If you have any questions about this product by eCandy, contact us by completing and submitting the form below. If you are looking for a specif part number, please include it with your message.